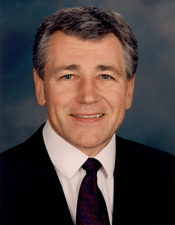 HAGEL, Charles Timothy (Chuck), a Senator from Nebraska; born in North Platte, Nebraska, October 4, 1946; graduated from St. Bonaventure High School, Columbus, Neb. ; graduated from the Brown Institute for Radio and Television, Minneapolis, MN, 1966; graduated from University of Nebraska, Omaha, 1971; served in the U.S. Army infantry, attaining the rank of Sergeant E-5, 1967-1968, and serving in Vietnam in 1968; newscaster and talk show host in Omaha 1969-1971; administrative assistant to Representative John Y. McCollister (R-Neb.) 1971-1977; manager of government affairs for Firestone Tire & Rubber Company, Washington, D.C. 1977-1980; deputy administrator, United States Veterans Administration, 1981-1982; investment banker and business executive in Washington and Omaha; deputy director and chief executive officer of the Economic Summit of Industrialized Nations (G-7) in 1990; elected as a Republican to the United States Senate in 1996; reelected in 2002, and served from January 3, 1997, to January 3, 2009; was not a candidate for reelection in 2008; Secretary of Defense in the Cabinet of President Barack Obama, 2013-2015.